Just some of my cookbooks! So my husband picked up a Canadian Living Magazine about one pot dishes and I can tell you I was skeptical at first - but we have a rule - the $1 rule. If the price of the cook book, divided by the number of recipes that actually interest us works out to $1/recipe or less than we can buy the item. However, if the book or magazine is more expensive we cannot get it. 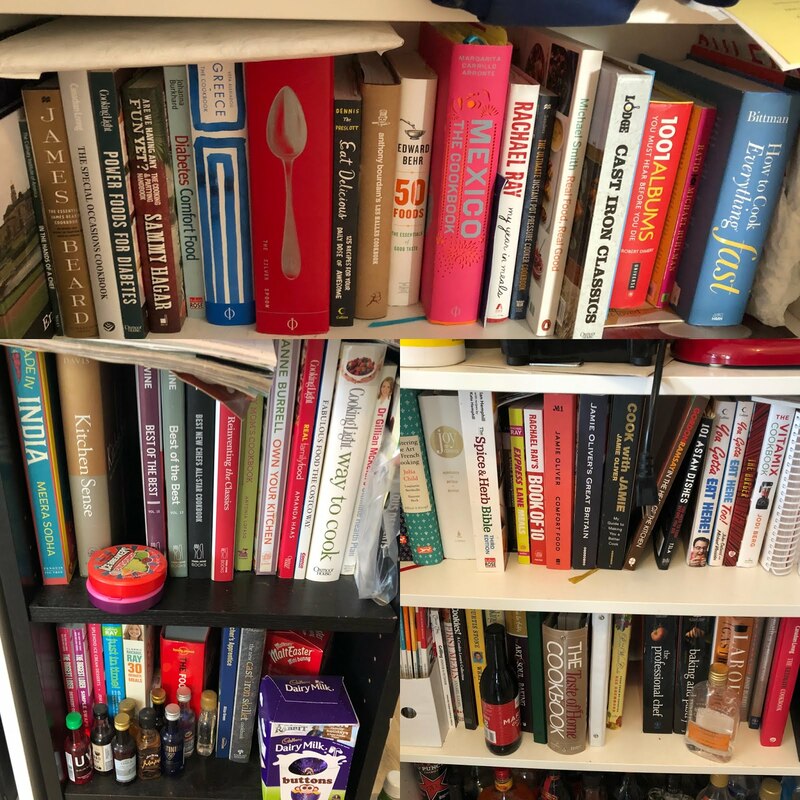 Now this may sound a little weird at first but - when you understand the number of cookbooks I have....(Now there are at least 10 books missing from this picture and are in different places around the house. So yeah - we have a lot of cook books that I have collected overtime. and they aren't all just cook books - I have a spice bible (which is amazing by the way). Anyways so as you can tell - this means the art of selecting new books to add to our collection is a very serious business. So as I said I was skeptical because I've had one pot books before and honestly it's usually not as promised. In this case - it wasn't as promised either. The recipe actually required two pots/cooking dishes but given how well this receipt turned out I am not going to hold it against the book. I would make some modifications to the recipe the next time I make it. It was really good but it could have been better. Sprinkle the chicken breast with salt, pepper (next time I would also sprinkle with the tandoori Masala). In a large saucepan of boiling salted water, cook the pasta according to the package instructions for al dente; drain well. Do not add oil to your pasta water and do not rinse the pasta. 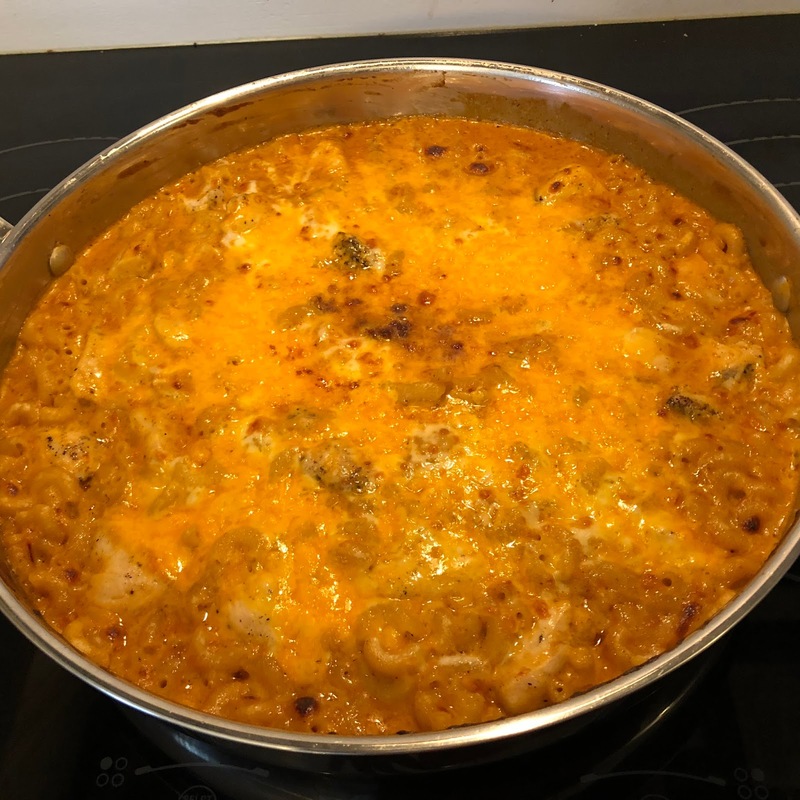 In a large ovenproof skillet, melt 1 tbsp of butter over medium heat; cook chick, stirring occasionally, until no longer pink about 5 minutes. I use butter chicken pasted instead of sauce. Next time I would add the paste to the chicken after it's done cooking mixed with just a little water to get the flavour all the way into the chicken instead. Once chicken is cooked, transfer to a bowl and set aside. In the same pan, melt the remaining butter over medium heat. Once melted add the chicken and cook until softened about 2 minutes. Be sure to stir occasionally. Whisk and cook until thick enough to coat the back of spoon - about 4 minutes. Honestly we just added all the cheese and grated more for the top! Stir in the chicken until well coated. Sprinkle with the remaining (or extra) cheese and broil until the top is bubbling and lightly browned about 3 minutes. Let stand for about 4 minutes and sprinkle with cilantro.. This is a very popular dish in our house hold now. 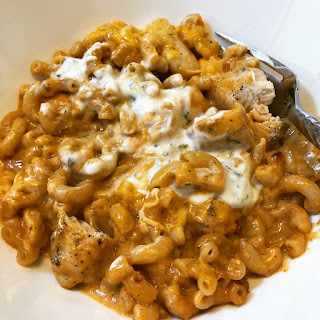 I didn't want to chop more cilantro and I already had a cilantro lime creama in the house so I used that - it was amazingly good! 1/4 cup finely chopped cilantro. Mix well and let mingle for at least 30 minutes.